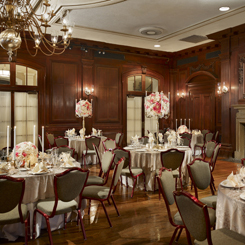 The Meade Room dates back to 1910 and is part of the 1910 "15th Street Building" designed by architect and League member Horace Trumbauer. In the SW corner of the rooms is the bronze plaque marking the cornerstone, set in 1909. The Room was originally a pool room with 14 tables. In 1954, with the decline in interest in pool and the increasing need for dining space in the League, the room was converted into an a la carte dining room. In 1982, a la carte service was moved across the hall and the Oak Room became a room for private dining. In 1991, the portrait of General George Gordon Meade was moved into the room and the room was renamed the Meade Room.